are shown with Olympic Gold Medalist and race coordinator Sandy Neilson-Bell (third from left). AUSTIN, TEXAS (April 29, 2018) At 10:30 a.m. in Austin, Texas, the 2018 Cap 2K Open Water Race and Pledge Swim will begin with over 200 swimmers from all over the United States competing. The race, which is billed as "The Only 'Downhill' Swimming Race in Texas" will start off the east end of Red Bud Isle and will consist of a 2000-plus-meter straightaway course ending at the Texas Rowing Center in Austin in Lady Bird Lake. The race is the brainchild of Dr. Keith Bell and his wife, Sandy Neilson-Bell and will attract swimmers as young as 12-year-old and as old as their 80s. The divisions include adults 18-and-over, youth 12-14 years old, , first responders, and a separate division for those choosing to wear a wet suit. The Cap 2K also includes a division for high school-aged swimmers. The 10th Annual Open Water Swimming H.S. Championships will see seventeen swimmers from the Houston area competing, including swimmers who attend First Baptist Christian Academy, Pasadena High School, Pasadena Memorial High School, Sam Rayburn High School and various swimming clubs from the Gulf area. As stated on the event's web site, it is held for fun, health and fitness, to promote clean water and water conversation, and to raise money for swim lessons for those less fortunate and to fight prostate cancer through support, education, awareness and advocacy. Awards to the top competitors will be presented at the conclusion of the race at Eiler's Park, which is next to historic Deep Eddy Pool in Austin. HOUSTON, TEXAS (April 28, 2018) The 3,591 fans at BBVA Compass Stadium were witness to the return of Kealia Ohai to the starting lineup, but it was not enough, as the Houston Dash dropped a 2-0 decision to the North Carolina Courage on Saturday afternoon in Houston. Ohai, along with newcomer Kyah Simon, excited the highly partisan crowd, but the Dash could not find the back of the net for the third loss of the season. Ohai talked after the game about her return. The Courage scored in the third minute with a long throw-in from forward Jessica McDonald, which bounced inside the penalty area and found forward Crystal Dunn in the right position for her third goal of the season. They added an insurance goal lead in the 48th minute after the Dash cleared a corner kick that fell to midfielder Kristen Hamilton. Hamilton settled the bouncing ball and uncorked a shot from 25 yards out that beat Dash goalkeeper Jane Campbell low to her right post. Dash fans were brought to their feet in the 76th minute when midfielder Linda Motlhalo went down on the pitch with an injury and had to be carried off the field by teammate Rachel Daly (shown above). The 19-year-old South African was replaced by Claire Falknor. Next up for the Dash is a Saturday, May 5 match up against Sky Blue FC in New Jersey. They return to BBVA Compass Stadium on Wednesday, May 9 to host the defending NWSL Champions, Portland Thorns FC. 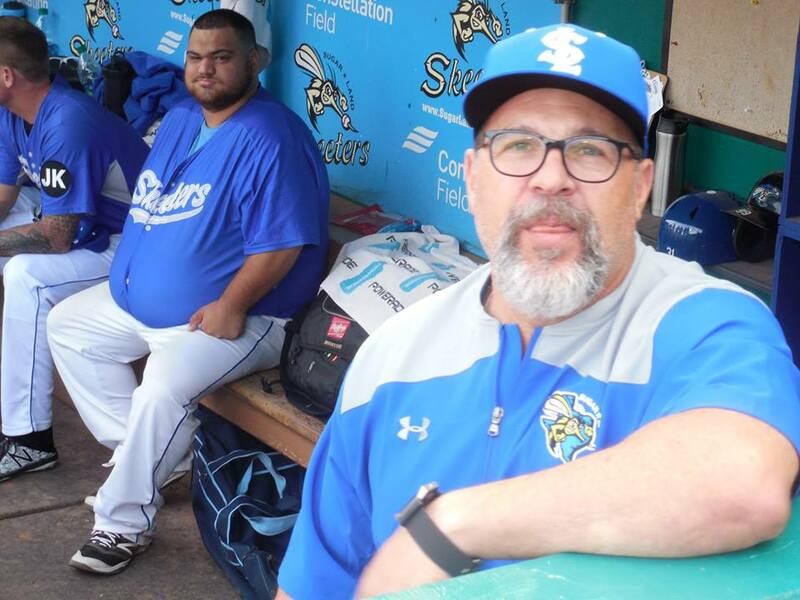 SUGAR LAND, TEXAS (April 28, 2018) Albert Cordero's walk off single in the ninth inning sealed a 5-4 win for the Sugar Land Skeeters over the New Britain Bees on Saturday, April 28 at Constellation Field in Sugar Land, Texas. The Skeeter catcher, who was pitch hitting for Alvaro Rondon, connected on a 1-0 pitch, to score first baseman Matt Chavez. The win pushed Sugar Land's record to 2-0 in the six-game season opening series. The Skeeters scores three runs in the first inning, with the Bees leveling the score in the second. Sugar Land regained the lead in the fourth and held onto their 4-3 lead when New Britain scored a single run in the eighth. After than, Cordero connected for his single to knock in the winning run. The series continues on Sunday with a 2:05 p.m. CDT start. Sugar Land's runs came from designated hitter Courtney Hawkins, who nailed a 1-1 pitch to deep right-center field for an inside-the-park home run to put the Skeeters up 1-0 in the bottom of the third. Center fielder Anthony Giansanti followed Hawkins with a triple, and was sent home on second baseman Alovaro Rondon's sacrifice grounder. The Bees scored their single run in the fifth inning. The Skeeters tallied their two runs on six hits while leaving only four on base. Starting pitcher Mitch Talbot received the win, going five innings while giving up four hits and one unearned run. The series continues on Saturday with a 6:05 p.m. CDT start. HOUSTON, TEXAS (April 21, 2018) For the fifth time in club history, the Houston Dynamo scored five goals in one game in route to a 5-1 win over Toronto FC at BBVA Compass Stadium. 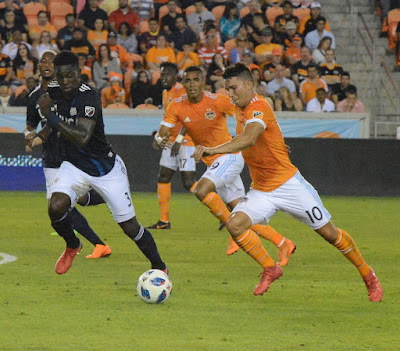 The win evened their record to 2-2-2 and snapped a two-game losing streak for Houston. 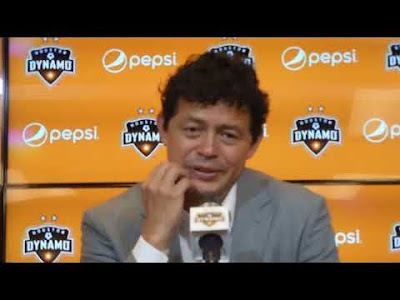 All it took was seven minutes and the Dynamo was already up by two goals. Three minutes into the game, Mauro Manotas nailed his third goal of the season to begin the game. Romell Quioto was crediting with the assist. 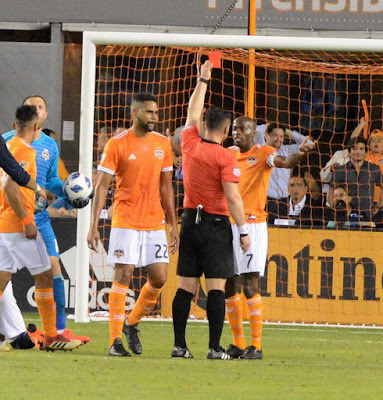 Four minutes later, Leonardo doubled Houston's offensive production for the afternoon when he converted a deflected corner kick, for his first goal of the season. In the first half, Toronto was called four times for off-sides, which certainly made a difference in the first 45 minutes. Houston added insurance goals in the 60th minute when Alberth Elis restores the three-goal lead for Houston; scoring his third goal of the season. Seventeen minutes later, Quioto tallied his first goal of 2018 to clinch the Houston win. HOUSTON, TEXAS (April 8, 2018) In a game that saw Carli Lloyd score her 100th international goal along with Alex Morgan's two goals, the U.S. Women's National Team downed Mexico 6-2 in an international friendly match at Houston's BBVA Compass Stadium. 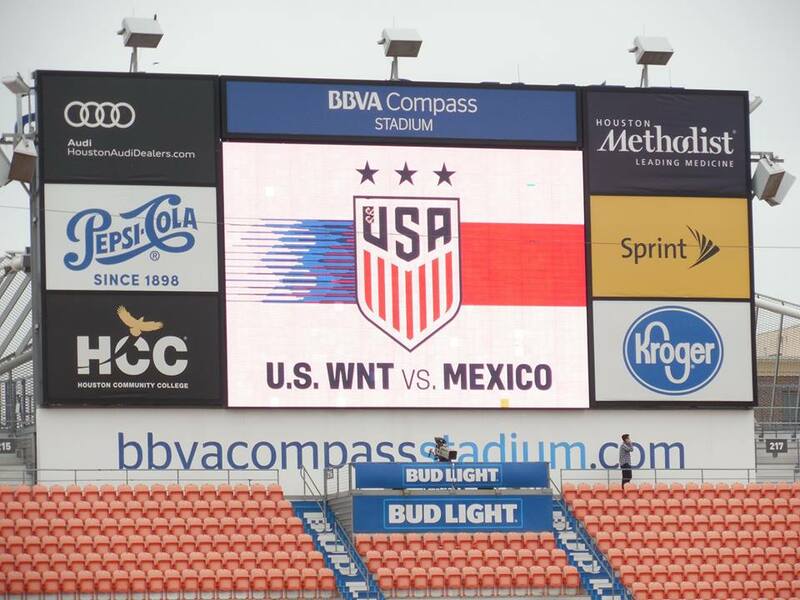 On Thursday, April 5, the USA also downed Mexico 4-1 at EverBank Field in Jacksonville, Florida. The Americans did not waste any time scoring when Mallory Pugh got around the Mexican defense and scored her 11th international goal to put the USA up 1-0 in the third minute. Mexico responded 14 minutes later when Monica Ocampo drilled the ball, from the left side, past goalkeeper Jane Campbell to tie the score. The goal was the 14th international goal of her career, which leads the current Mexico team roster. El Tri took the lead in the game when Kiana Palacios scored off a corner kick by Ocampo in the 17th minute. After that, the USA scored three unanswered goals to close out the first half of play with a 4-2 lead. The first of the three goals came from Lindsay Horan in the 25th minute. Nine minutes later Lloyd headed in the third American goal, and her 100th international goal, from the center of the goal area with an assist from Morgan. With two minutes remaining on the half, Morgan tallied her 84th international gaol to put Brian the USA up 4-2. Megan Rapinoe was credited with two assists in the first half; on the goals by Horan and Morgan. The United States padded their lead in the second half with goals by Rapinoe (64th minute) and Morgan (69th minute). It was the 36th international goal for Rapinoe and 85th for Morgan. Three Americans saw their first action for Team USA. Haley Hanson (Houston Dash), Hallie Mace (UCLA), and Tegan McGrady (Stanford) all received their first cap for the United States. Hanson came into the game in the 40th minute to replace Horan. Mace entered the game in the 50th minute for Tierna Davidson, while McGrady took over for Pugh in the 58th minute. 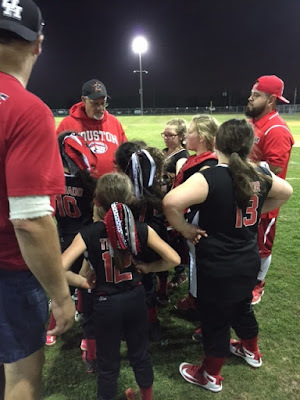 LA PORTE, TEXAS (April 7, 2018) The Deer Park 8U Cougars Girls' Softball Team stormed through the first two rounds of the La Porte Girls Softball Tournament, scoring a total of 25 runs in two games at Little Cedar Bayou Park in La Porte, Texas on Saturday, April 7, 2018. In their first game of the tournament, the Cougars downed the South Houston Extreme by the score of 11-0. The "Ladies in Red" scored four runs in both the first and second innings, and added three insurance runs in the third for their first win of the tournament. Their 11 runs was the result of 14 hits while leaving only three runners on base. They followed that with a 14-13 win over Deepwater Xplosion to go 2-0 in the winner's bracket of the tournament. Against Deepwater, the Cougars needed two extra innings to secure the one-run victory. Against the Extreem, nine of the ten Cougars playing in the game reached base, with left fielder Quinn Romero, shortstop Aubrey Rogers, and catcher Kirstin Kelly each scoring two runs. Pitcher Cali Telles, first baseman Riley Wilson, center fielder Jocelynn Wall, second baseman Emilee Mendoza, and right fielder Paige Taylor connected at the plate for seven RBI, with third baseman Melina Delgado and rover Mia Ceniceros adding runs for the Cougars. The Cougars had a tough match up in their second game of the tournament against Deepwater. They jumped out to a 4-1 lead after one inning, and held an 8-5 lead after two. Xplosion cut Deer Park's lead to two in the third and tied the score at eight in the fourth when the Cougars failed to score. That marked the end of regulation; forcing the game to extra innings. In the fifth inning, Deepwater exploed for four runs to take the lead 12 -8. The Cougars responded in great fashion, scoring four runs to again tie the game. In the sixth inning, Deer Park held Xplosion to a single run to take the score to 13-12. The Cougars began the inning with runners at second and third (as per the tie breaker rules) when Kelly strode the plate. and after two pitches, connected for a fly ball over the second baseman's head and into center field; scoring Delgado and Rogers from third base and second base, respectively, for two runs and the win. Romero, Telles, Wilson, Delgado, and Wall were three-of-three at the plate, with Mendoza, Ceniceros, and Taylor adding hits and runs late in the game to add to the Cougars' total. Deer Park will face the Deer Park Hooks in the third round of the tournament with a 9:05 p.m. CDT first pitch. The Cougars are managed by Larry King and coached by Abel Mendoza and Dale Yurt. Selected Cougar games are broadcast live on Facebook direct from the ballpark. Contact Robert H Kelly at texsportpub@aol.com for details. 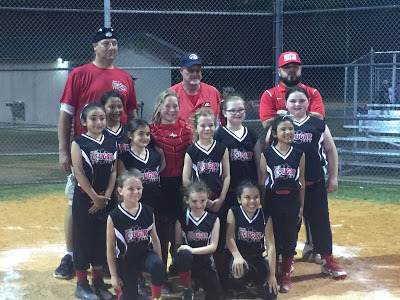 DEER PARK, TEXAS (April 2, 2018) Third baseman Melina Delgado was three-for-three at the plate and connected for a two-run home run in the third inning to lead the Deer Park Cougars 8U softball team to a 11-5 win over the Deer Park Crush at the Deer Park Adult Softball Fields on Monday evening. The Cougars tallied their 11 runs off 15 hits to raise their league record to 2-3 for the season. They scored their first three runs in the first inning, with solid hitting by Delgado, left fielder Quinn Romero (1-for-1, one run), shortstop Aubrey Rogers, (two singles, two runs), rover Jocelynn Wall (single, RBI) and catcher Kirstin Kelly (single, RBI). They added a single run in the second inning off a sacrifice grounder by Romero, scoring flex Mia Ceniceros from second base. The third inning saw the Cougars add three runs to their total, with first baseman Riley Wilson, Delgado, and Rogers all scoring runs. Right fielder Paige Taylor (1-for 2, single), along with Ceniceros, pitcher Cali Telles, and Wilson added insurance runs in the fourth. Second baseman Kalissa Telles (1-for-2, single) also scored a run in the fourth. Center fielder Genesis Rodriguez had a great game defensively, fielding the ball on numerous plays to limiting the Crush advancing runners into scoring position. Next up for the Cougars is a Wednesday, April 4 rematch with the Deer Park Savage. The Cougars downed the Savage 10-8 on March 26 for their first win of the season. First pitch is set for 6:15 p.m. CDT at the Adult Softball Complex in Deer Park. The Cougars are managed by Larry King, and coached by Able Mendoza and Dale Yurt.